Kirsten Rikkert from Wierden and the KWPN approved stallion Crespo VDL (Canturo x Candillo) were the eye catchers of the 1.30m class. 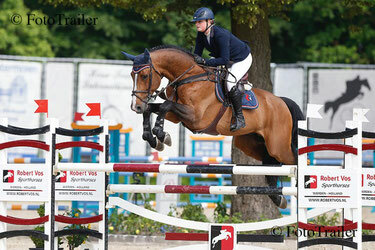 They won the Willem Greve Sportpaarden Prize with an excellent round in the two phases class. Madée Schuttenbeld was runner-up with Vayrenta (Haarlem), formally ridden by Yvonne van Dijk.